Chevy Suburban. With seating up to 8 passengers and maximum cargo space of 137.4 cu ft., this vehicle multi-tasks between utility and luxury. This vehicle is perfect for business or leisure travel, featuring fine leather bucket seats with lumber support and plenty of head and leg room. The Cadillac Escalade. This vehicle is the perfect corporate luxury vehicle for up to 6 passengers. The Escalade features fine grain custom leather seats, rear ventilation ducts with controls, 39” head room, 39” leg room and 16.9 cu. ft. luggage capacity with a maximum cargo capacity of 108.9 cu ft.
Not seeing what you’re looking for? That’s because you are seeing only our most commonly-used vehicles. This does not mean that we don’t have what you need! 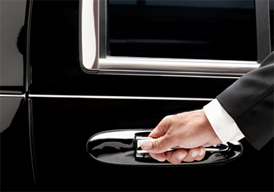 Check out more info on our Specialty Limos page.